Governments, foundations, and the private sector are all engaged in the task of providing a quality education to the millions of children who are born into poor socio-economic circumstances throughout the world. This is crucial because education is seen as the most certain vehicle for breaking the cycle of poverty. As institutions embrace ways that education technology can play a part in accomplishing this goal, the developing world’s private school sector is well primed to explore the potential of ed-tech in the classroom. The market forces that shape low-income private schools have built-in incentives for both experimenting with new technologies and finding adoption methods that would work for their school. While government funded ed-tech initiatives have the potential to work, there are disadvantages to government-funded schemes that work against education technology taking root in the classroom. To illustrate this point, we’ll draw on the research that we conducted on education technology in Hyderabad, India’s affordable private schools (APS). Affordable private schools (APS) empower parents in low-income communities with choices that are no longer restricted to the wealthy. Some government schools in India do a fine job of teaching children solid academic fundamentals. However, according to the recently released ASER report on the State of India’s education, the overall trend in public school performance doesn’t paint an optimistic picture. A little less than half of Indian children in 5th grade can read at a 2nd grade level, a number that has steadily declined from 53% in 2010. Similarly, the percentage of 5th grade students who can solve two-digit subtraction problems has gone from 61% in 2011 to 53.5% this year. The students’ performance in the basics of math and reading is falling at a faster rate in government schools than private schools. With APS, parents are no longer restricted to whatever free educational option is available in their communities. APS schools offer parents the opportunity to exercise agency and assert new forms of accountability with school leaders and teachers. As paying customers who are the financial lifeblood of the school, parents’ desires influence what the school leader invests in. One thing that parents largely want is technology. Parents are drivers in APS technology consumption. As it stands, the primary consumer of ed-tech in APS is the school leader. A portion of the cost may be passed on to the parents through technology fees; however, the primary financial burden lies with the owner. The reason so many school leaders take on this expense is because their customers demand it. 53% of parents use computer classes as a major parameter for deciding which private school they choose. The parents’ demand for technology has created a relatively high penetration of technology in schools. Based on our research for our report Education Technology in India: Designing Ed-Tech in Affordable Private Schools, 69% of Hyderabad APSs have computer labs and 58% have techno classes. The average expenditure on technology in APS schools in the 2011-2012 year was $2048. School leaders seek opportunities to acquire technologies used by wealthier private schools in order to stay competitive among other private schools and to establish themselves in the eyes of the consumers—the parents. As a result, APS students get exposure to computer labs, smart classes with interactive surfaces, and digital projector solutions. It’s important to note, however, that though the technology penetration in these schools looks impressive from the outset, there are still challenges. Technology can take it further. The existing implementation of smart classes and computers have major weaknesses, but with each new ed-tech trend, APS stakeholders learn more about what their technological needs are and what kind of solutions can help fill those gaps. Emerging technologies in APS can help account for several shortcomings in the schools and help raise the students’ quality of education. 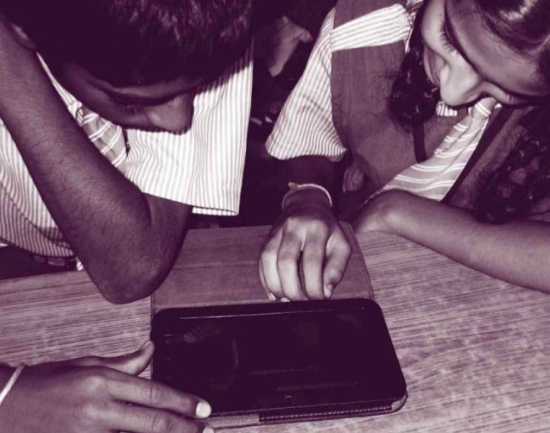 For instance, in our pilot of tablets in APS in Hyderabad, India, we saw how the device paired with the right content could be used to actually help teachers as opposed to attempting to replace them. The built-in assessments could automate the scoring, recording, and distribution of exams, creating more time for teachers to actually teach children new material. With a 1:1 interaction with the device, students will be able absorb the information at their own pace and can help teachers accomplish differentiated instruction in the classroom without strong academic training. This becomes especially important for girls in APS, who we found have %40 less exposure to Internet than their male counterparts. With technology in APS, schools can become equalizers in the digital gender gap between students. Technology’s potential to address challenges in APS is noteworthy, but another important element of ed-tech in APS is that cost keeps solution providers accountable to providing tangible value to the school. Sometimes buy-in has a cost. One of the most novel aspects of the tablet pilots that were conducted in Hyderabad is that the parents purchased the devices in monthly installments over the school year. Parents who could not afford the installments were given tablets that were subsidized by the school leader and could only be used in school. This gave the students full ownership of the tablets rather than the school. This sense of ownership made both students and parents especially concerned with keeping it intact. In government schemes where devices are provided to all students for free, you do have the advantage of making sure all students have equal access to the technology regardless of their financial position. However, what is the consequence for poor adoption, or a weak attempt to make use of the technology? Providing free devices does remove some accountability for the kind of engagement needed from both schools and parents to make new technology solutions successful. In APS, if parents don’t see convincing results for their investment, it sullies the reputation of the school leader and renders the tablet a sunk cost. This creates levers of accountability for both the school and parents to help enforce proper use of the tablet by students. Technology works in environments that support it. APS schools self-select for parents who are willing to invest financially in their children’s education despite their low-income. This can create an environment where parents are open to trying new approaches to helping their children succeed academically. We witnessed this personally in the tablet pilots when parents showed a willingness to pay for personal tablets that their children would use in the classroom despite never having used a tablet themselves. Private education is going to be a substantial part of educating children, so it’s in everyone’s interest that the quality of private schools be the best they can be. Through thoughtful implementation and well-designed solutions, technology can help accomplish that. Kim Campbell is the lead investigator and author for the report Education Technology in India: Designing Ed-Tech for India’s Affordable Private Schools. Hila Mehr and Ben Mayer co-authored the report. Don’t miss a MOOC post! « Is Technology a Silver Bullet for Private Schools But Not for Public Schools? Written by Kim Campbell and Hila Mehr on May 9, 2013 in Public vs Private Schools.